Peter Parker: The Spectacular Spider-Man #311 Review – AiPT! A fun but insignificant feeling Spider-Geddon tie in. 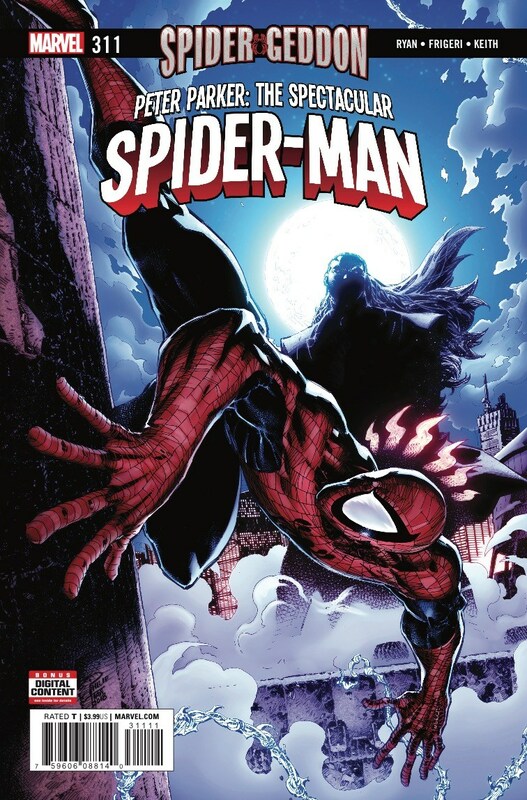 One of Peter Parker’s most powerful, dangerous, and deadly villains, Morlun, is back (see Spider-Geddon #1) — so why doesn’t it feel like it? It may be because this Spectacular Spider-Man offering from writer Sean Ryan and artist Juan Frigeri suffers from a tonal whiplash that it falls into early on and just doesn’t find the means to recover from, as fun as it all is. That’s a thrilling, dark sounding setup. One that could go in any variety of directions that readers would find satisfactory coming out of the affable but suitably dark Spider-Geddon #1, but instead it leans into a quip-filled cat and mouse game that feels like it’s biding time for something to actually happen in the following issue. It’s hard to deny that this Parker is fun, and Ryan writes him as a quick-witted, quirky and surprisingly lighthearted character who I could see myself caring about in balance to a well-established stakes or darker tone but, that equal weight doesn’t get enough credence here. Morlun merely following along screaming “Spider!” or fumbling through his attempts to kill his most hated enemy feels off-kilter and under-powered — despite the occasional hits he lands trying so desperately to convince us otherwise. Dissimilarly, however, Frigeri’s art is a balanced, pulpy affair that mostly conveys a good sense of scenery, impact and a good physicality to the cast that keeps things feeling human and meaningful – bruises and blood building on an embattled Parker. It could, similarly to the narrative, stand to be a little darker — maybe cast more shadows along or from our imposing villain, but for the most part it’s a competent and worthwhile offering that does its job — some confusing action scenes notwithstanding. In the end, this feels like a missed opportunity for the first tie-in born out of a Spider-Geddon where the Inheritors just proved their grisly intention and ability. A largely implausible, but hilarious and light cat and mouse game that could’ve been more but sticks to what felt safe — disappointing but not without merit. An average, if slightly disappointing first tie-in to Spider-Geddon proper, this is a fun but flighty feeling issue that misses the mark tonally despite offering some cool moments. Ryan writes a wonderfully fun feeling Parker -- quip-filled, quick-witted and still fun loving in the most dire of circumstances. Nothing here really feels like it matters or like Spidey is any real danger as time and time again Morlun is rebuked with ease.